Now let me contemplate why You [Jesus] had Yourself nailed to the cross in the Place of the Skull, a place filled with the bones of the dead. Ezekiel walked among the dead men’s bones and prophesied as he was commanded, and immediately the dead bones came to life [Ezek. 37:1-10]. You too, O Lord Jesus, stepped through the dead bones to the holy cross, and one by one spoke Your seven words of power, sprinkling them with Your blood. What happened? The graves were opened. 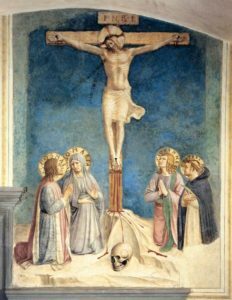 The power of Your blood was displayed: “Truly, truly, life is in Your blood.” By tradition, painters paint a skull at the foot of Your cross, showing thereby that Your blood has the power to blot out our death and take it away. This then shall be my armor against danger and death.